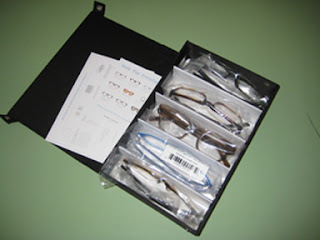 That Tad Guy: What it’s like to do the Warby Parker home try-on. What it’s like to do the Warby Parker home try-on. My glasses of ten years* broke a year ago. And it just so happened at the worst time possible: before my insurance kicked in. Okay, maybe not the “worst time possible”. That seems a bit extreme given the current economic climate. How about, “it occurred at an inconvenient time”? Much better. So my glasses broke and a friend of mine recommended I try an Internet retailer named Warby Parker. They sell designer frames, with prescription lenses and shipping, for $95. Plus, they donate a pair of glasses (it’s not clear if the glasses are from their collection) to someone in need. So I went to their site, uploaded a photo and decided to go with a pair of black, horned-rimmed glasses named, the “Huxley”. After a year, they are working just fine. But that got me to thinking … maybe I should get a back-up pair, just in case? However, since my situation wasn’t as dire, I decided to use their “home try-on” option. You log in, select five frames and they ship the glasses to you for free. I chose the Felton with a fade, the Digby in a whiskey tortoise matte, the Huxley in sandalwood, the Roosevelt in Bondi blue and the Wiloughby in striped chestnut. Some frames faired better than others, with the Digby and the Felton coming out ahead. It was a fun experiment and free, too. All I had to do was put the frames back into their original packaging, use the provided mailing label and drop the whole thing off within 5 days at a UPS shipping location.